The varsity volleyball season came to a close this past week with Wells teams ending on a very positive note with both girls and boys winning their respective AISAA varsity volleyball championship tournaments. 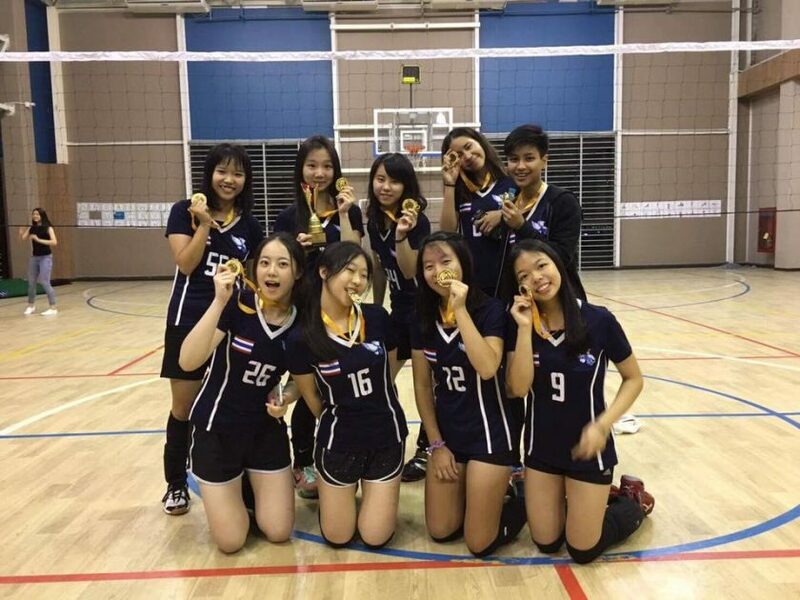 In the inaugural girls volleyball tournament of the Asia Interscholastic Athletic Association (AISAA), the Wells varsity girls volleyball team came up on top in a field of seven schools, bringing home the school’s first girls championship trophy of the year. In pool play, Wells came out strong, cruising to victories over fellow AISAA members Berkeley, 2-0 (25-7, 25-9), and Mahidol, 2-0 (25-8, 25-8). 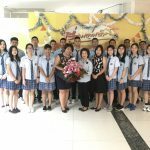 Their toughest competition in their pool was visiting Logos International School from Cambodia, also winning in straight sets, 2-0 (25-10, 27-25). Entering the play-offs with momentum and confidence on their side, our Lady Seahawks stormed through the brackets, beating AISAA members Ekamai in the quarter-final match, 2-0 (25-13, 25-15) and Concordian in the semi-final match, 2-0 (25-14, 25-19). 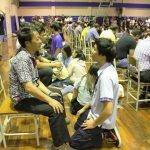 In the championship game, Wells faced another team from Cambodia, East West International School (EWIC). Though clearly deserving to be in the finals, EWIC couldn’t match the confidence and consistent play of our girls as Wells won in straight sets, 2-0 (25-20, 25-22). Wells varsity boys team capped off the most successful season in the program’s 7-year history with its fourth championship trophy, winning the inaugural AISAA Boys Varsity Volleyball Tournament on Thursday, October 19. With the wins, the Seahawks ended the season with a 26-1 record, with a single loss coming against an adult team at the ISKL Twin Towers Invitational in Malaysia. The eight-team tournament was also the largest tournament ever hosted by Wells with five AISAA teams and three visiting teams from around the region. In pool play, Wells came out strong, with victories over visiting Logos International School (Cambodia), 2-0 (25-9, 25-10), followed by straight-set wins against fellow AISAA members Mahidol University International College, 2-0 (25-12, 15-10), and Ekamai International School, 2-0 (25-17, 25-7). As the winner of the pool, our boys earned a spot in the semi-finals of the championship bracket, facing the Eagles, an up-and-coming program from Bangkok Advent School. Despite a strong, scrappy defense, the eagles were no match for Wells power offense as the Seahawks prevailed, 2-0 (25-16, 25-7). In the championship game, Wells had a chance to reassert its dominance with a rematch against Ekamai, the third meeting between the two teams in a little over a week. Despite the long day, the outcome was no different with Wells winning the championship, 2-0 (25-15, 25-11). 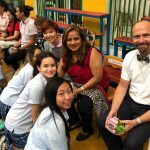 Other schools participating in the tournament included fellow AISAA schools Concordian International School and Berkeley International School (Bangkok, Thailand), as well as another visiting school, International School Eastern Seaboard, Pattaya, Chonburi (ISE) from Chonburi. For video footage of Wells’ tournament games, as well as most (if not all) other Wells volleyball matches of the 2017 season, visit Sean Ogden’s Sports YouTube Channel. Along with volleyball matches, the tournament allowed us to recognize two of our programs graduating seniors who played their final games with the team: Matter Kwanlertchit and Ping Ping Praepant (Ping Ping Liu). 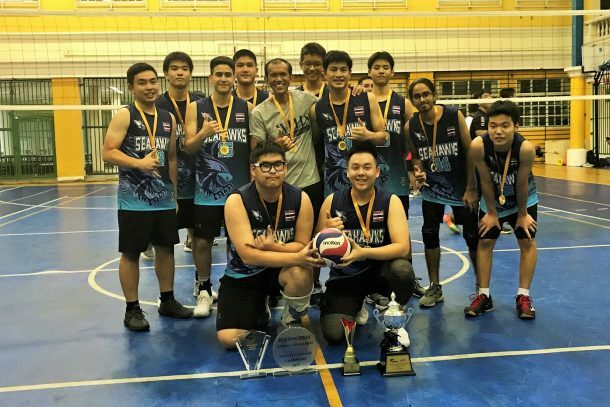 Also representing Wells were Juniors, Sean Ogden, Finn Dardarananda, Ryosuke Toda, Yuta Nishio, Jira Trinetkamol, and Sunand Sethi; Sophomores, Possawat Akarapan and Pew Apithanangsiri; Freshman, Perth Vichitchoti; and coach, Ray de la Pena.